Shane's Rib Shack's 6th annual RIB GIVEAWAY! ATLANTA (May 5th, 2015) – According to Technomic’s 2014 Top 500 chain restaurant report, sales for fast casual chains grew by 11 percent and store count by eight percent, a testament to the growing fast casual industry. While the nation’s largest restaurant chains have struggled to make headway with consumers in recent years, menu-focused fast-casual concepts such as Shane’s Rib Shack have captured the market share. Evident in its regional dominance, Shane’s Rib Shack has contributed to the fast-casual growth trend by growing primarily from within the franchise base. Strong gains in average unit volume over the past three years have existing franchise partners eager to open new units. A targeted growth strategy in the Southeast has proven fruitful with new openings in 2015 scouring Alabama, Florida and Georgia. 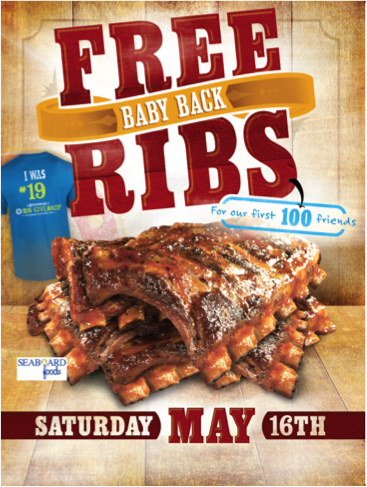 As a thank you to its loyal fan base and the communities in which the restaurant serves, Shane’s Rib Shack will host its seventh annual Rib Giveaway on Saturday, May 16. The first 100 guests at participating locations will receive a free half rack of slow-cooked baby back ribs, a 20-ounce beverage and special edition Rib Giveaway t-shirt in honor of the official month of BBQ. For more information or to find a nearby location, visit www.shanesribshack.com. Shane's Rib Shack is a true American rib shack, known for its slow-cooked ribs, hand-chopped chicken and pork, and many southern sides to complement each plate. The original shack was founded in 2002, in McDonough, Ga. by Shane Thompson, who started the restaurant with his grandfather's secret BBQ sauce. Since becoming a franchised restaurant in 2004, Shane’s Rib Shack has grown to become the country’s model fast-casual barbecue concept. In 2015, Shane’s Rib Shack was featured in the Wall Street Journal and in 2011, Shane’s Rib Shack was recognized as a Top 100 Movers and Shaker from FastCasual.com. Shane’s Rib Shack currently operates 71 locations. For more information, visit http://www.shanesribshack.com.